Police and fire crews at the scene of the gas leak on The Strand. Workmen accidentally drilling through a gas pipe forced evacuation of businesses in the Tauranga CBD today. 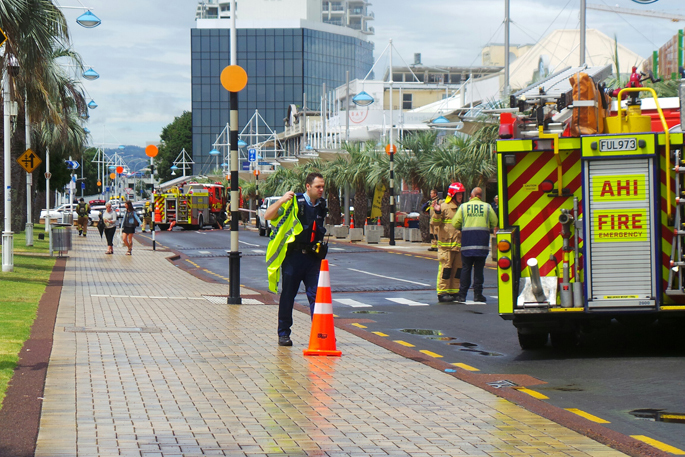 One of the busiest streets in the City, The Strand, was blocked off from Wharf Street through to Hamilton Street for more than four hours as emergency services tried to isolate the gas leak. At least six businesses were evacuated. Fire station officer Neil Brown says no one suffered any health problems. “We knew where the leak was because there’s a drilling rig there that accidentally drilled through a gas pipe, that’s what caused the leak,” says Neil. “The Gas Board came along and used their equipment to trace the pipe work and dig remotely from the leak because it was safest way to isolate the gas. The gas leak was a major disruption for businesses in the area. Owner of the Crown and Badger, Jess Rafferty, says they missed out on a lot of business because there is a cruise ship in town and it looked like it would have been a busy lunch time. “To top it off we had around 10 people, who had mostly finished their lunch, who had to be kicked out in the evacuation. The road is now open to traffic, but some business owners and their employees haven’t been allowed back into the building because of the lingering smell of gas.